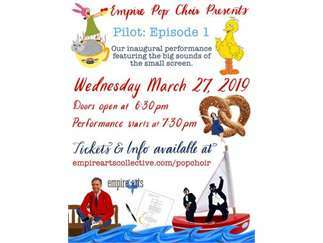 Join us for our first concert on March 27th at the Track 7 Natomas Tap room-Episode 1: Pilot For our debut concert we're celebrating the big sounds of the small screen. From the melancholy sweetness of the Cheers theme and Rainbow Connection from The Muppet Movie to the fist-pumping power of pop bangers like On a Boat, television is an unsung hero of musical creativity. We'll sing songs from The Lonely Island, Queen, the shows Galavant, Crazy Ex-Girlfriend, This is Us and many more. Track 7 will be open for service and we've invited a food truck for the night to supply the provisions you need. All proceeds will go to support Empire Arts Collective, a non-profit performing arts incubator. Doors open at 6:30pm, the event starts at 7:30pm.